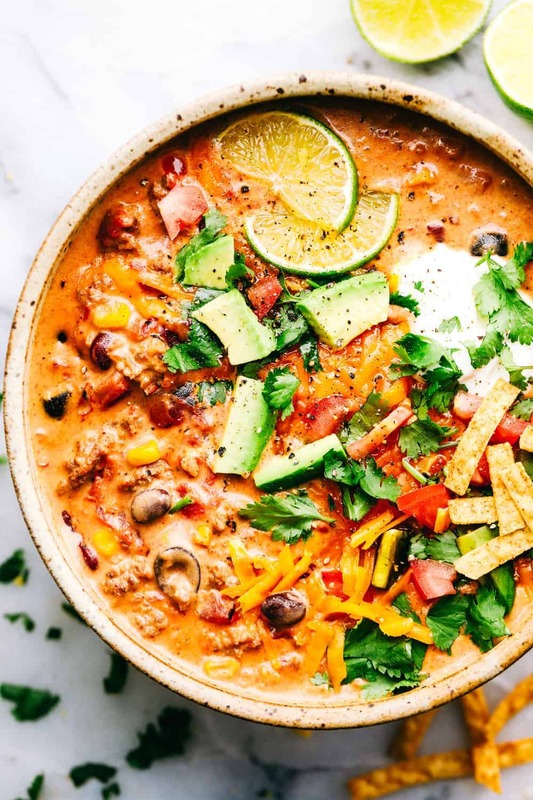 Cheesy Taco Soup is so simple to throw together and is loaded with taco inspired ingredients. The cheesiness takes this soup to the next level of delicious and will be loved by the entire family! In a large pot over medium high heat add the ground beef. Cook and crumble until no longer pink and drain the grease. Add the diced tomatoes, corn, kidney beans, black beans, olives, taco seasoning packet, and beef broth. Add in the velveeta cheese OR the shredded cheddar cheese. Stir together and bring to a boil. Reduce heat to medium low and let simmer for 2-3 minutes to let the flavors blend and serve with desired toppings.